so I set out trying to aggregate data from 15 different sources (all IDENTICAL schema), and create one report that aggregates the data but still identifies each source. EXTRACT 1= BITS_Extract.tde CatalogName = "BITS"
EXTRACT 2= CS_Extract.tde CatalogName = "CS"
I have BITS_Extract.tde opened, I append it with contents of CS_Extract.tde and the CatalogName of record is CS_Extract.tde are all renamed from "CS" to "BITS"
in each of your data sources via Custom SQL. 2) Re-create your data source schema from scratch. Data --> Convert to Custom SQL and edit your code as above. Then join other tables / views / Custom SQL selects. Re: Hello, in version 8.2, where is the custom sql option in the excel workbook connection ? Re: 8.2 New Connection has Window Less Functionality? This is an interesting feature I didn't know. Still this won't help him because this doesn't allow union from multiple data sources. Scaffolding is a way to help him to some extent. materialized in each extract before appending. with a row-level single-value "calculation". This will enable union across multiple data sources, it seems. or Datasource_ID for an upcoming 9.2 Union. It seems that such appended data is a one-time thing. It can't be made dynamic. That means, if I added data from Source A to Extract AAA, then refreshing AAA will not add data from Source A again. So the append is materialized. It is not a union on the fly. If the extract AAA is an extract from a database, after appending data from a file or a data source, it can keep adding data by incremental refresh from the original database. I found that Convert To SQL doesn't apply to extracts from Excel files. Maybe that there is already an option to do that via legacy connection. be it ANSI SQL or the likes (bQL for Google BigQuery or HiveQL for Hive). MS Jet Database Engine, which talks plain SQL, too. hence Convert to Custom SQL. and in particular with the introduction of Tableau for Mac -- talks no SQL. Hence no Custom SQL / Covert to Custom SQL. R/SAS/SPSS - Google Analytics - Web Data Connector. This gentleman can apply "convert to custom sql" to excel file. I can't. I am using 9.1. and the option is grayed when the file is excel. See if you can reproduce it? 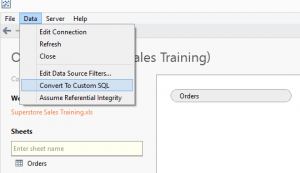 For this example with Superstore Sales, the mention of Custom SQL comes with a caveat, and that is that I’m going to have to use the Legacy Excel connector to take advantage of JET, and as a result I’m afraid this is going to be PC only. If you’re on MAC and have data in Excel you’re going to have to do some pre-processing to either get it into a database or utilise a product like Alteryx. Yuri, I did see that passage. Could you reproduce that with an excel file?